You should turn the machine on before starting the software. Otherwise you will receive an error message as the start will automatically involve an attempt to connect to the control. Should you forget to start the machine, you can still do it and then press „repeat“ a few seconds later. You need to Register as user with the software for security reasons. To do so, go to Menu->User->Login. On the lower edge of the screen in the middle you can see which users are currently registered. As an unregistered user, you have no right to move the machine or start programs. The options are highly limited as seen in the numerous buttons and menus, which have been greyed out. After registering as a normal users, all the buttons will be activated and you can operate the machine. In order to keep the screen as comprehensible as possible, the main window has four pages. The tabs at the very top under the title and menu list can be used to move between the pages. The precise significance of all the individual element is explained in detail in the “User controls” chapter. One factor all four pages share is the Coordinate Display (white figures against a blue background) and the text window in the middle for messages. 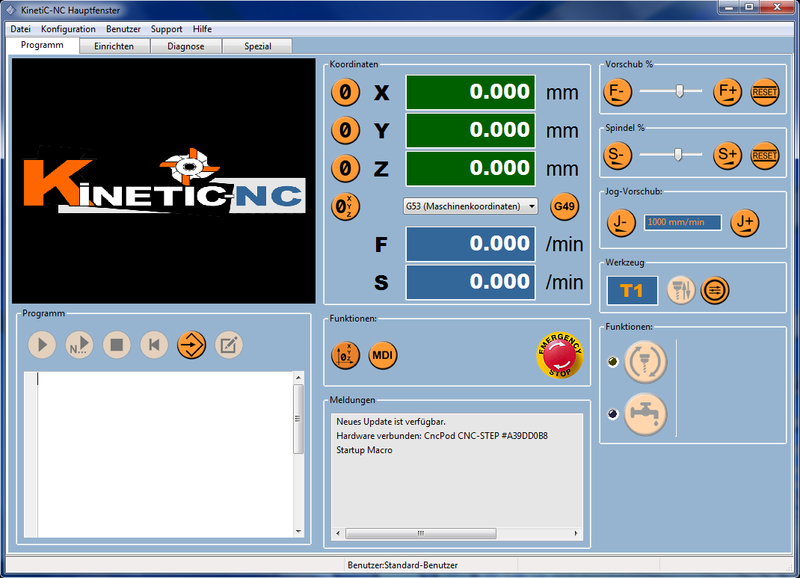 The primary page (“Program”) has a graphic display in the upper middle, where the company logo appears after the start. After loading the program, the tool path will be displayed. Underneath is the window for the program test, which remains empty after the program start.